The Broadway has teamed up with award winning Make Up Artist Clare Jane Garrett to bring you some amazing Halloween Hacks. 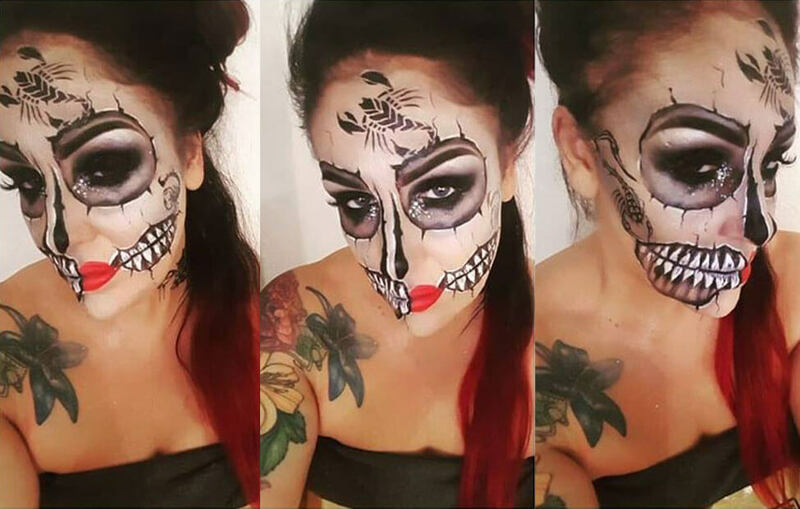 This will give you all the inside information to professionally create a gorgeous ghoulish guise for your Halloween night out. Better still, Clare’s also shared where to find all the make up from The Broadway Bradford, so you can create the look at home. Prep with a primer to ensure your frightful face stays put until dawn. Then add a foundation that’s perfectly pale. Don’t forget to highlight – even ghouls can glow! Next, you need to contour your face – it’s up to you how dramatic you want this to be, but don’t let the contouring distract from the details that you still need to add. Now for smoky eyes, you’ll need to go heavy on your eye make up. Line your upper and lower lids, add mascara, eye shadow and of course, some vamptastic lashes. Time to add the details. For this you’ll need a liquid eyeliner and a steady hand. Carefully draw out details such as skull outlines, teeth across your cheeks and any further details you want to add like the scorpions I’ve included. Smudge the inside of these lines with black eyeshadow and the outside with a white liner – this gives a great 3D effect. Finally add red lipstick and some sparkles like the ones I’ve placed near the eyes to really make this deathly look come alive!